Number of tracers counted during analysis. 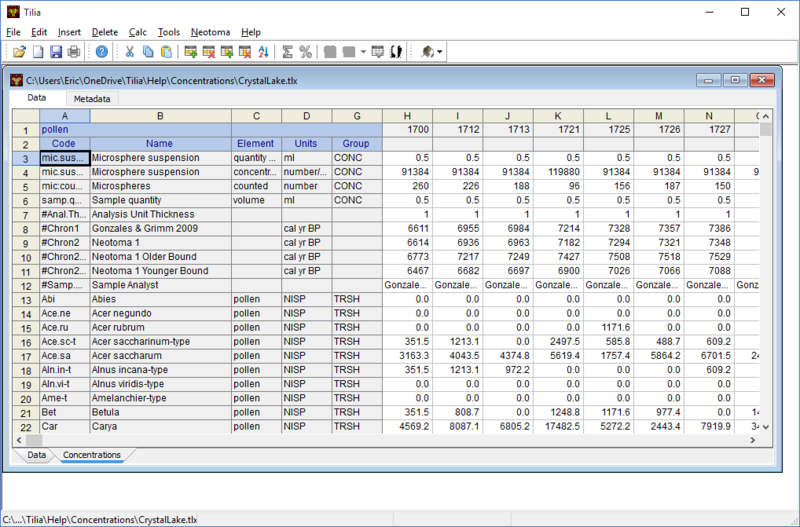 All variables added to the spreadsheet for calculating concentrations should be assigned to the CONC group. The codes and names of the CONC variables can be anything; however, if standard codes, as described below, are used, Tilia can automatically assign the CONC variables to the appropriate parameters described above. The examples of CONC variables below are for different variations of Method 1, which is the most common method. Selecting Yes will give the same result as Calc > Concentrations. If No is selected, an empty Concentrations worksheet will appear, in which, for example, concentration results from Excel could be pasted. The Methods listed are those described above. The Groups to include box lists the taxa groups in the spreadsheet. Select the ones you wish to convert to concentrations. Click the Include All button to include all groups. On the right are boxes for the CONC variables in the spreadsheet. 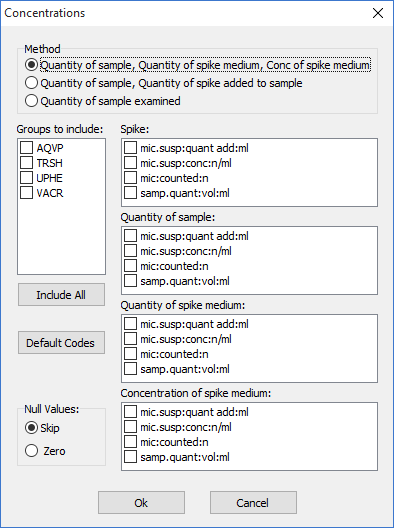 Select the appropriate variable in each box for the selected Method. Alternatively, if default CONC codes were used, click the Default Codes button, and Tilia will attempt to select the appropriate variables. The Null Values box indicates whether null values (blank cells) in the spreadsheet should be treated as null (no data) or as zero values. In this example, Include All and Default Codes were checked, and null values are to be treated as zeros. Click the Ok button to calculate concentrations, which will appear an a new worksheet. The .tlx file used in this example may be downloaded from here (Gonzales & Grimm 2009).